He said congressional gridlock should not shape interpretations of statutes. Three years ago, Kennedy voted to invalidate PPACA. A Supreme Court justice wouldn’t use a congressional hearing to signal his vote on the Patient Protection and Affordable Care Act (PPACA), would he? Justice Anthony Kennedy sent a ripple through the universe of court watchers Monday when he told lawmakers that the justices should interpret statutes without worrying about congressional gridlock. Kennedy didn’t specifically mention PPACA, or the King vs. Burwell case, but his comments prompted immediate speculation that he will read the law as barring crucial tax subsidies to insurance purchasers in two-thirds of the country–leaving it to the president and Congress to negotiate what would seem an unlikely fix. “This does not bode well for the government,” blogged Josh Blackman, a PPACA critic who teaches at South Texas College of Law. Kennedy voted to invalidate the law three years ago when the court considered a broad constitutional challenge. He dissented as Chief Justice John Roberts joined the court’s four Democratic appointees to uphold the measure. 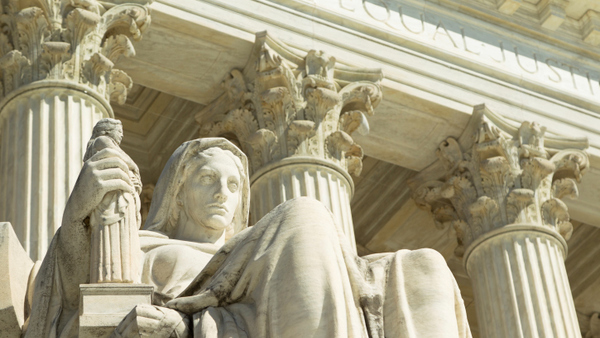 With the court now taking up another PPACA challenge–this one focused on the law’s inartful wording–many court experts assumed Roberts would again be the most likely fifth vote to save the law. Then the court heard arguments March 4, and the thinking shifted. Roberts said next to nothing, and Kennedy, the court’s most frequent swing vote, hinted he was open to backing the administration. Kennedy told a lawyer challenging the tax subsidies that “there’s a serious constitutional problem if we adopt your argument.” The justice said that limiting subsidies to the handful of states that have set up their own insurance exchanges, as the challengers seek, might amount to unconstitutional coercion of the states that did not set up their own markets, pressuring them to do so. Kennedy intimated he might interpret a disputed four-word phrase in a way that avoided that problem, and saved the PPACA tax credits. Jump ahead to the congressional hearing. A rep. asked Kennedy about his previously expressed concerns that the court handles many politically charged issues. Kennedy answered by saying that a “responsible, efficient, responsive” Congress and president can alleviate some of the pressure on the court. Kennedy went on: “We routinely decide cases involving federal statutes, and we say, `Well, if this is wrong, the Congress will fix it.’ But then we hear that Congress can’t pass a bill one way or another, that there is gridlock. So what does that mean for health care? As Blackman noted in his blog post, the issue of gridlock came up during the argument. Justice Antonin Scalia (a likely vote against the administration) said he expected Congress would jump in if the court rules against subsidies and sparks the disastrous consequences predicted by the administration. Kennedy didn’t join in that questioning, so it’s not clear whether he sees a connection to his concerns about coercion. Nor is it at all obvious Kennedy had health care on his mind when he spoke before the congressional panel. And, of course, even if Kennedy backs the PPACA challengers, the administration still can hope for winning over Roberts. Segal went so far as to tweet congratulations to Jonathan Adler, the Case Western University law professor who was one of the first to make the case that PPACA doesn’t authorize nationwide subsidies. Adler wasn’t buying it, saying Kennedy was merely describing the court’s established approach toward statutory interpretation.